SiteGround Review 2019: Is SiteGround a Good Hosting? SiteGround has a great reputation and a huge customer base for a company that hasn’t been around very long. It offers exclusive, custom-built WordPress tools and low introductory prices, and aims to be beginner-friendly while aso appealing to experienced web developers. SiteGround offers an impressive variety of hosting plans, including managed WordPress and WooCommerce hosting. Find out if it’s the right host for you. Bulgaria-based SiteGround has only been around since 2014, but it’s quickly becoming the Mr. Popularity of the hosting world, with over a million active sites. The company provides powerful tools for experienced web developers, while promising an easy hosting experience for even the newest of newbies. SiteGround offers everything from simple shared hosting (with a website builder included), to managed WordPress and WooCommerce plans, to scalable cloud hosting, dedicated servers, and enterprise solutions. It has data centers in five locations, spread out over three different continents. A little something for everyone, you say? Well, I’m not a big believer in the one-size-fits-all approach. If it’s not true of t-shirts, it’s certainly not true of web hosts. You need to find the right host for your needs. In this review, I’ll be taking a closer look at SiteGround’s features, ease of use, performance, and support. Join me and we’ll figure out together if the new Mr. Popularity is going to bring out the best in you and your website, or if he’s only going to hang you out to dry. SiteGround offers an impressive set of tools to boost your website’s performance and security. Even better, you don’t need to be a web geek to use them (well, you can be, but it’s not obligatory). If hassle-free WordPress hosting sounds like a dream come true, you’ll love SiteGround’s managed WordPress hosting. All plans come with full email hosting, a free CloudFare CDN license, HTTPS support, a free SSL certificate, and a bunch of performance and security enhancing tools we’ll discuss in a moment. If WordPress isn’t your thing, or if you’re just starting out with your first website, you’ll be happy to know that SiteGround’s shared hosting plans come with the Weebly website builder. I’ve used it before, and I can tell you it’s so much fun to use, it doesn’t even feel like work (but then again, I am a bit of a geek). Now, let’s take a deeper look at some of SiteGround’s most interesting features. Whether you’re a geek or not, you should care about your website’s security. You don’t want to have to deal with someone else’s security breach spreading to your server. Trust me. While SiteGround provides you with a bunch of security tools, one of its most important features is its secure infrastructure, based on LXC-container architecture. This means that your hosting server will be securely isolated from other users. It also means that those other users can’t eat up your server resources and affect your website’s performance. SiteGround also uses one of the best server monitoring tools, Guardian by 1H, which scans its servers and alerts its technicians of any threats or issues. If you’re a WordPress user, this plugin can connect your website with SiteGround’s WordPress-optimized infrastructure. This not only boosts your website’s performance – it also makes managing your site easier, with one-click SSL installs and a PHP version manager. The plugin comes with some other great tools you’d normally have to pay a premium for. You can use it to configure HTTPS for your site – all it takes is a single click. You can also use it to purge cache, exclude URLs, or even optimize your images and CSS or HTML. It also gives you access to SuperCacher, which is one of the best dynamic caching tools for WordPress. 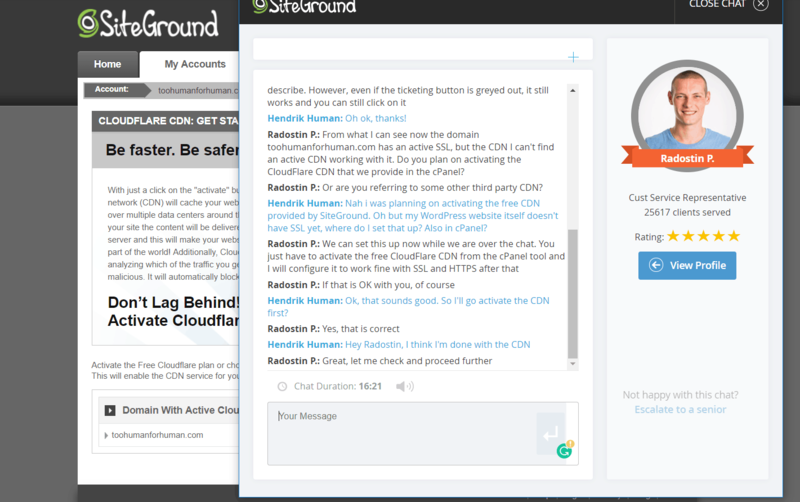 This is another one of SiteGround’s proprietary tools, which provides you with some cool features not many hosts offer. Powered by Sucuri, it mainly acts as a malware detection system. It also scans every page you link to from your homepage to check for infected URLs or blacklists. Whenever SG Site Scanner detects an issue with your website, it will alert you immediately so you can take action. SiteGround offers all the geek essentials, like one-click staging, manual and automatic backup and restore, and cPanel. But it also offers a few unique features you won’t easily find elsewhere. Just keep in mind that you’ll need to sign up to one of the GoGeek plans to get them. Your hosting will come with pre-installed SG-Git, which allows you to add your site to your own Git repository so that you can download and work on multiple branches of your website code anywhere. You’ll also be able to set up secure e-commerce websites for merchants using SiteGround’s PCI compliant hosting. All hosting accounts also come with WP-CLI pre-installed, so you can manage your WordPress website from a command line interface. SiteGround has simplified some of the more technical aspects of hosting management, to make the experience nice and easy for users of all levels. 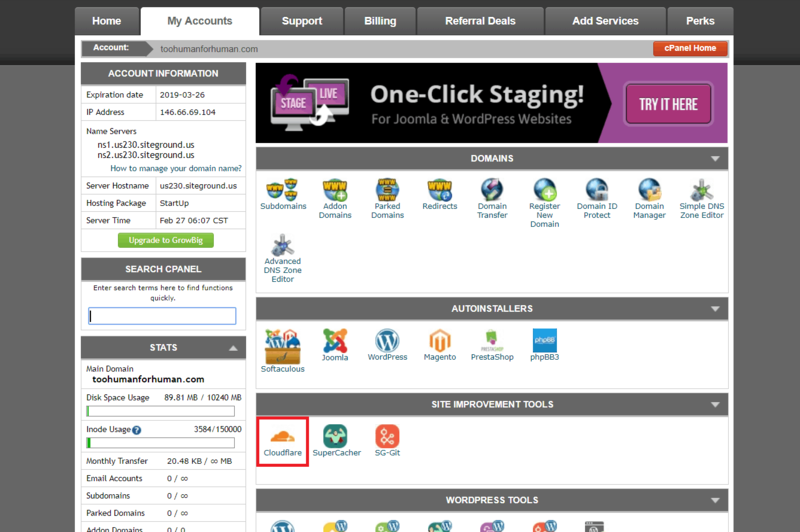 SiteGround offers a simple, user-friendly dashboard featuring integrated cPanel. It’s not very impressive as far as looks are concerned, but it gets the job done. SiteGround started out geared almost exclusively at developers. These days, the company tries to cater to a wider range of customers, and I think they manage to pull it off. Things aren’t as intuitive as they could be and there’s not a lot of hand-holding going on, but the managed hosting products are quite easy to use. Signing up with SiteGround is easy. Just be aware that the 12-month plan is automatically selected. There’s one upsell – yes, only one – SG Site Scanner, which isn’t checked by default. The sign-up process took me about 10 minutes to complete, and I can’t see any reason why it would take longer than that. You can read all about it here. When you log into your SiteGround dashboard for the first time, the first thing you’ll see is the option to install the CMS (Content Management System) of your choice. All it takes is one click, and there’s a very nice selection, too. On top of popular options like WordPress, Joomla, Drupal, and Weebly, you can select from a list of e-commerce platforms like Magento, PrestaShop, ZenCart, and others. It should be noted that some of these are notoriously tricky to install on your own. SiteGround’s one-click installer makes setting up WordPress as easy as…well, one click. To connect your domain, all you have to do is point your nameservers to SiteGround. Your SSL certificate/HTTPS won’t be activated automatically, so you’ll have to do that yourself. SiteGround’s one-click installer and simple CDN setup wizard definitely make things easier for hosting newbies. It would, however, be nice if they could provide better documentation. Take a closer look at the process of setting up my SiteGround hosting account here. cPanel is one of the most popular hosting control panels around, but its user experience is known to be less than stellar. The good news is that SiteGround’s version is easier to use, even if you’ve never used cPanel before. It’s built right into the hosting dashboard, and SiteGround has removed most of the unnecessary apps and integrations, keeping it nice and clean. CloudFlare is a third-party CDN service, and it is known to be a pain to set up. You’ll find CloudFare built into your SiteGround dashboard, making it easier than ever to use. You can activate it on your site with just a few clicks, and without having to play around with your DNS settings. You can also choose to upgrade to premium CloudFlare licenses from the same screen. 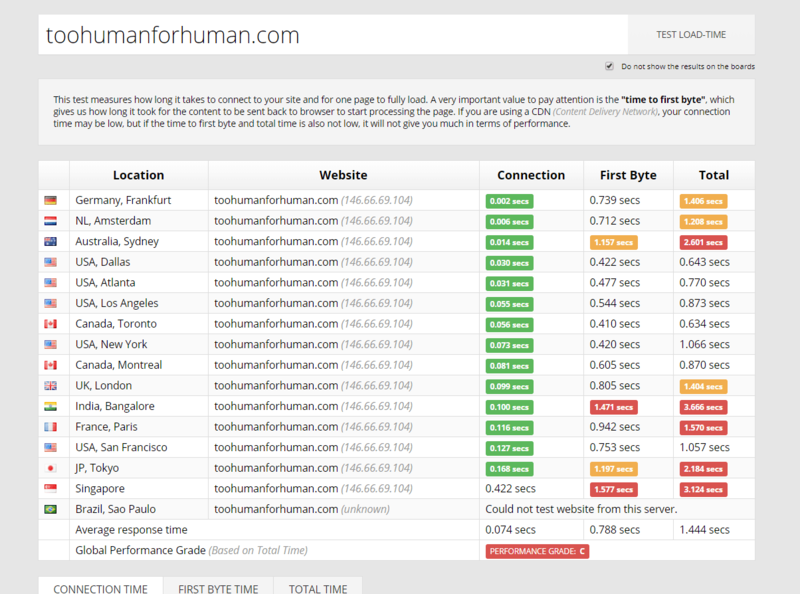 Yes, SiteGround is one of the few hosts to offer its own performance-enhancing tools, but are they good enough? SiteGround boasts of its “Speed and Uptime Technology,” and backs that by a 99.99% uptime guarantee. 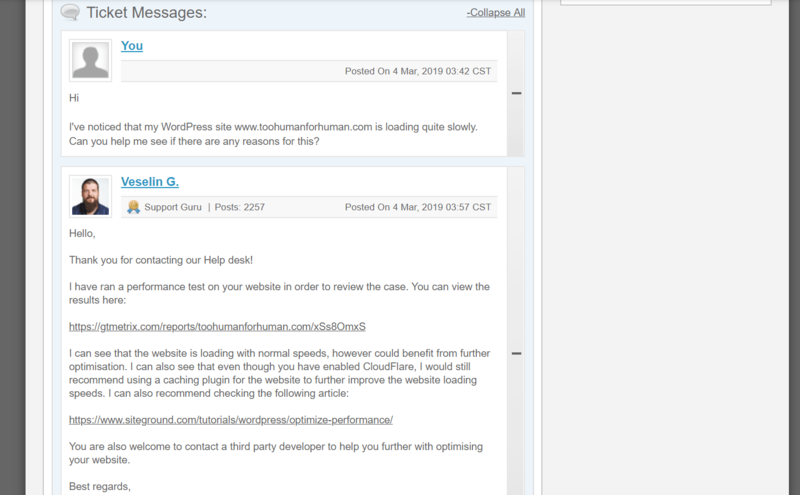 I used the Sucuri page load speed tester to check my WordPress site. Now, this isn’t just your plain old default WordPress site. I went to the trouble of installing some heavyweight plugins like WooCommerce and Jetpack, and then I threw in a multimedia-rich template to boot. I also had an active CloudFare CDN running. I chose a data center in Chicago. I have to say, I was somewhat disappointed with the results. As you can see, SiteGround only scored a measly C in Sucuri’s test. Page load times were pretty decent in the U.S., but the further you go, the worse it gets. Even New York crossed the one-second mark, and in countries like India and Brazil, loading times were way past the point where you are expected to start losing a lot of visitors. Granted, my SiteGround website did have a few big plugins installed. But even taking that into account, SiteGround is still a bit of a slouch compared to other hosts. If you’re a WordPress user and you’re going to sign up with SiteGround, it could help to uninstall some of the pre-installed plugins you don’t need. You could also use SuperCacher to optimize your performance, but you’d need to invest some time in that. That said, SiteGround does provide outstanding uptime. According to multiple online sources, the uptime is 100% for most months, and averages out at around 99.99% over a longer period of time. During my time with SiteGround, I experienced no downtime at all. So, if your website’s uptime and availability is more important to you than page loading times, then SiteGround may still be a good option. It’s a Bird…It’s a Plane…It’s Super Support! Quick responses from highly professional support agents who obviously know their stuff – what else could you possibly want? SiteGround’s best feature might actually not have anything to do with its servers or software. In my opinion, the incredible live chat is what really sets it apart from other hosts. No matter what support channel you prefer, you can expect a very quick response. They say they answer phone calls and live chat queries instantly, and reply to tickets within 10 minutes. Let me tell you from personal experience: this is no bluff. 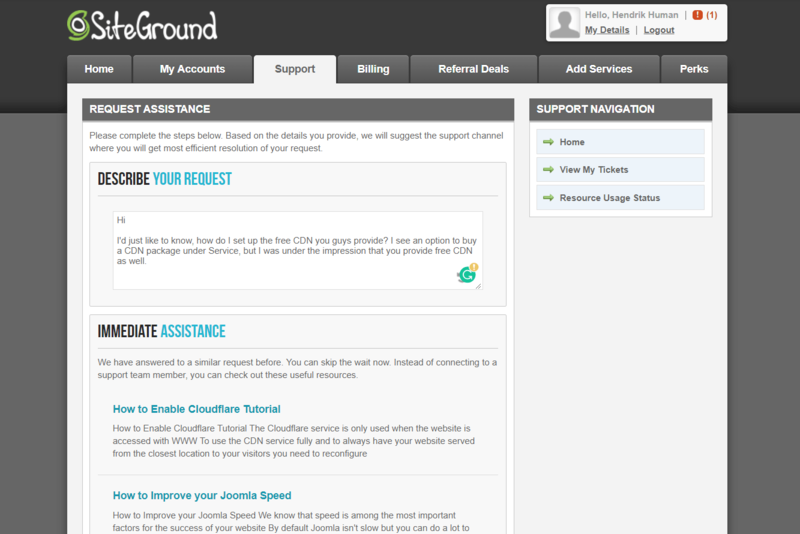 I’ll even go as far as to say that SiteGround has the most capable support staff I’ve come in contact with. They reply quickly to any question you might have, no matter how technical, and you never get passed around from agent to agent. This shows you how knowledgeable they are. Support is available 24/7. I’ve only seen the live chat unavailable once, but it only lasted about 10 minutes. The very first support query I made was during sign-up. I couldn’t verify my banking details due to a foreign currency issue, and had to reach out to support to verify my account. Even though I hadn’t technically signed up yet, I got a response almost immediately. This kind of issue always takes a while to resolve, but Radostin, my friendly support agent, was with me every step of the way. There were never long gaps where he left me hanging, and he always made sure I was managing before moving on to the next step. When I wasn’t sure whether to set up my SSL or CDN certificate first, Radostin was once again there in a flash to help me out. Not only did he answer my question, but he also offered to set up both my CDN and my SSL certificate for me. I took him up on his offer for the SSL certificate but wanted to do the CDN myself. Even though the process dragged on for over 30 minutes, he never lost his positive attitude. He always made sure I knew what was going on, and I never had to wait long for a reply. It wasn’t just a first-impressions thing, either. All my follow-up emails were met with speedy replies. This is exactly what excellent customer support means. The only thing I found slightly annoying was that you have to go through a few steps before you can actually contact support. You’ll have to narrow down your search by category. Then, when you type in your query, you get links to support articles. Only then can you actually open a ticket or start a live chat. This process is a bit tedious, but in my experience, it was always worth it in the end. SiteGround’s introductory prices are low and you definitely get good value for your money, but you’ll need to keep an eye on those renewal rates. SiteGround’s Web Hosting, WordPress Hosting, and WooCommerce Hosting all offer the same basic packages with the same prices. The prices may seem low – which indeed they are – but keep in mind that these special rates only apply to your first hosting term. After that, they increase quite significantly. Another thing you need to know is that if your prefer to pay monthly rather than annually, you’ll need to pay a setup fee. It’s a bit disappointing that none of SiteGround’s plans include a free domain, but if you’re planning on transferring an existing website to its servers, the good news is that the company will cover the cost of your domain and domain privacy for the following term. Unfortunately, you don’t get this perk if you’re building a new site. Sure, there are cheaper options out there, but SiteGround’s StartUp plan is still very affordable. However, I feel that their GrowBig and GoGeek plans are slightly overpriced compared to the competition, especially considering the fact that you don’t get unlimited hosting. With InMotion Hosting’s similarly priced WP-4000S plan, for instance, you get more than five times the storage, three times the visitors, and many of the same features. That said, if you’re planning on hosting multiple sites or you’re a reseller, SiteGround is one of the cheapest options for you, as you can host an unlimited number of sites. You’ll be happy to know that you can try out SiteGround’s hosting risk-free with a 30-day money-back guarantee. This is a pretty standard policy, but it does also cover your setup fee if you signed up for a month-to-month plan. But what I really like about SiteGround’s refund policy is that you can cancel your account and get a refund without having to talk to support at all. You just need to run through a quick step-by-step cancellation wizard. If you find talking to support about cancelling your account as awkward as I do — this is very convenient. 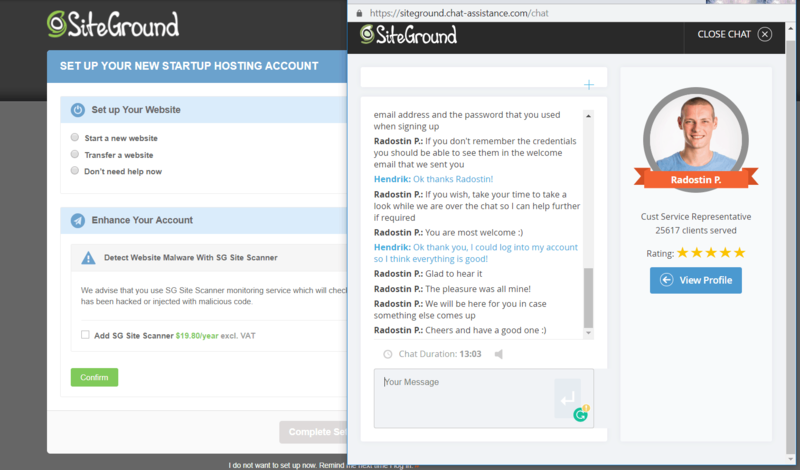 To see how to cancel your SiteGround account and get a refund, click here for a step-by-step guide with screenshots. The Good, the Bad, and the Geeky: Is SiteGround the Right Host for You? On one hand, SiteGround’s combination of exceptional uptime and watertight security means your website should always be available and your data will always be secure. On the other hand, it’s hard to ignore those mediocre page load speeds. 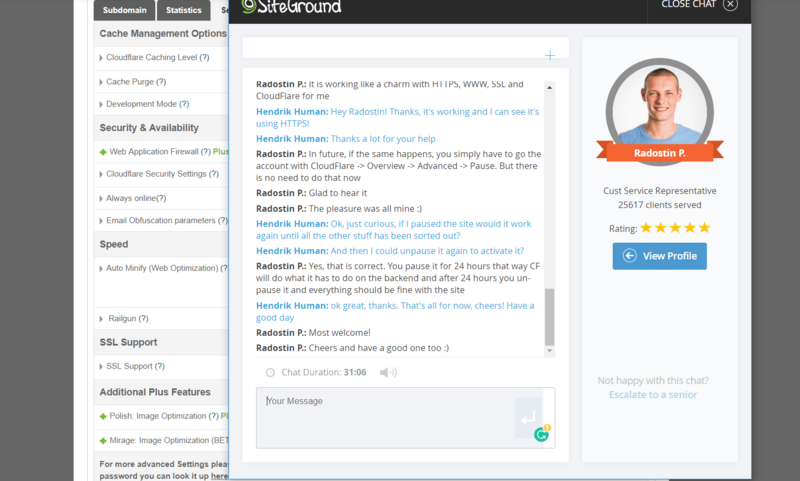 The one area where SiteGround outshines the competition is its fantastic customer support. The prices aren’t bad either, but you get less storage space than what other hosts provide for the same cost. So, would I recommend SiteGround? It all depends on who you are and what you need. If you’re tech-savvy, you know you like cPanel, and you have the time to optimize your site’s performance, then SiteGround is an excellent developer-friendly option – particularly if you plan on hosting multiple sites. If you’re looking for a beginner-friendly, plug-in-and-go type of hosting experience, then I think there are better hosts out there for you. That said, SiteGround is still a new player in the hosting scene, and from what I’ve seen so far, I think it’s only going to get better and better. Wondering how SiteGround stacks up against other Web Hosting companies? Enter any other Web Hosting company and we will give you a side-by-side comparison.